Providing you the best range of plant tissue culture rack with effective & timely delivery. Plant Tissue Culture Rack offered find wide usage in laboratory environment where these are used in areas of tissue culturing of plants as well as in other tissue culture work. These tissue culture racks are flawlessly constructed using tubular mild steel pipes that come in painted finish so as to provide the structure due protection from issues like corrosion for durability. We can offer these Plant Tissue Culture Racks in different specifications comprising fluorescent light tubes that come built at upper portion of work table. Further, these tissue culture packs are also available with UV germicidal lights which come fitted inside racks as well as fluorescent tube chocks & germicidal tube chocks fitted outside racks. For accurate performance, these also possess 24 hour digital timer along with control panels which come fitted on top of tissue culture rack so as to achieve efficient performance standards in given applications. 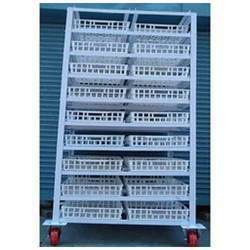 Looking for Tissue Culture Racks ?